Named for the southern belle from Gone With the Wind, the Scarlet O’Hara is as genteel a drink as its namesake. The cocktail features the liqueur that is a gem of the south, Southern Comfort. A significant serving of this bourbon-based liqueur is poured over ice, then topped with cranberry juice and a dash of lime. The lime juice is an optional, yet preferred adder to the cocktail. The Scarlet O’Hara has, for some time, been a popular drink and is a drink that all bartenders in those southern US states should know. 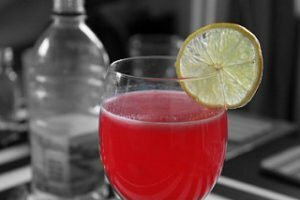 The slight sweetness of the bourbon based liqueur balances the sourness of both cranberry and lime in this cocktail. If your guest prefers a little added sugar, consider squirting in a dash of simple syrup. This drink is surprisingly close in make up to the vodka based Cosmopolitan, where the Southern Comfort is simply swapped out for the simpler spirit. Note that for you nostalgic fans of the classic movie, there is also a Rhett Butler to complement this sweet drink. And if you like cranberry juice as a mix for your drinks, you might also like the Sea Breeze or Cape Codder!